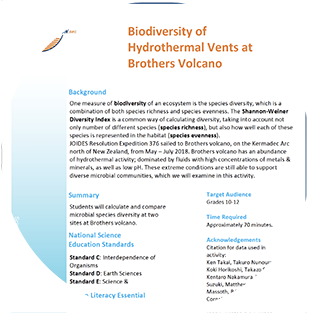 Actvity Summary: Students will calculate and compare microbial species diversity at two sites at Brothers volcano. One measure of biodiversity of an ecosystem is the species diversity, which is a combination of both species richness and species evenness. The Shannon-Weiner Diversity Index is a common way of calculating diversity, taking into account not only number of different species (species richness), but also how well each of these species is represented in the habitat (species evenness). JOIDES Resolution Expedition 376 sailed to Brothers volcano, on the Kermadec Arc north of New Zealand, from May – July 2018. Brothers volcano has an abundance of hydrothermal activity; dominated by fluids with high concentrations of metals & minerals, as well as low pH. These extreme conditions are still able to support diverse microbial communities, which we will examine in this activity.